Third seed Novak Djokovic pulverised Andy Murray 6-4, 6-2, 6-3 to win his second Australian Open on Sunday, dashing British hopes of a first men's grand slam champion in 75 years. "I dedicate this title to my family, my brothers, my girl Jelena back home, my people that have been with me for so many years," an emotional Djokovic said as he cradled the trophy. "It has been a tough period for our people in Serbia," added Djokovic, who also paid tribute to the victims of the recent Queensland floods. "We are trying every single day to present our country in the best possible way, so this is for my country Serbia." Djokovic then saluted hundreds of noisy fans wrapped in Serbian flags from the balcony of a television studio, holding the trophy aloft soccer-style as they bounced up and down singing below. "This means the world to me," he said. 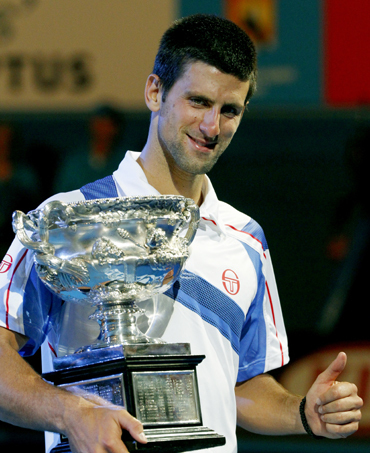 "Any grand slam title is a huge achievement. I have dedicated my life to the sport. "I'm still 23 and hopefully will have more chances to win grand slams. It really gives me a lot of motivation. It's a huge confidence boost." 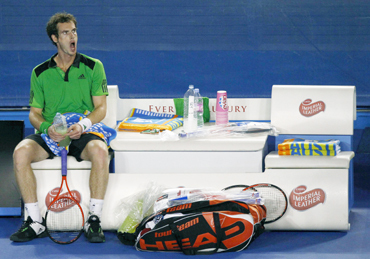 Murray, rattled by noise from Djokovic's box and berating himself for his ineptitude, began to unravel in the second set, screaming at his own coaching team: "Be quiet!" 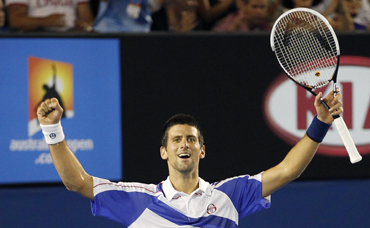 Djokovic celebrated by throwing his racket, shirt and shoes into the crowd as a packed Rod Laver Arena went wild. Novak Djokovic has every chance of becoming world number one this year after winning his second Australian Open in Melbourne on Sunday, according to Serbia's Davis Cup captain Bogdan Obradovic. Djokovic, who lifted his first grand slam trophy in Rod Laver Arena in 2008, raced to a 6-4 6-2 6-3 whitewash of Briton Andy Murray and Obradovic said the Serb's effervescent performance showed a more mature player than three years ago. "Djokovic has improved in every department and quite frankly, I expected him to beat Murray after the way he played throughout the tournament," Obradovic told Reuters in a telephone interview. "He has become mentally and physically stronger, he is even more accurate with his passing shots than in 2008 and can win points quickly when he needs to. "With all that in mind, it will be very difficult to stop him from becoming the world number one this year, if he keeps playing at this level throughout the season." Djokovic had only a brief break after steering Serbia to their first Davis Cup title in December and Obradovic believes that success galvanised the world number three in the season's opening grand slam event. He lost the 2008 U.S. Open final and last year's Melbourne final in straight sets, both times to Roger Federer. 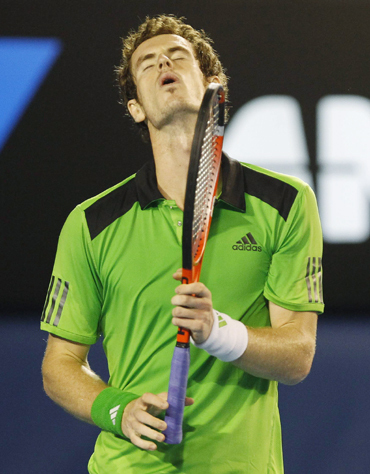 "I'll try to keep it together this year," said Murray, who had been reduced to tears by Federer last year. "I won't lose sleep over it. I want to try to win a grand slam but if it doesn't happen, it doesn't happen." Katarina Srebotnik and Daniel Nestor teamed up to dash hopes of at least one local champion at the Australian Open by winning the mixed doubles title on Sunday. Slovenian Srebotnik and Canadian Nestor edged Australia's Paul Hanley and Chan Yung-jan of Taiwan 6-3, 3-6 (10-7) after a super tie breaker on Rod Laver Arena. Srebotnik had won four previous grand slam mixed doubles titles -- the last two with Nenad Zimonjic -- but it was her first at the Australian Open and a first with Nestor. "She's already dumped me for the next grand slam to go back to her regular partner so this was my one chance and I'm glad I took it," joked Nestor, who won the title here in 2007 with Elena Likhovtseva. While Hanley had been hoping to give the locals something to cheer, Chan would have been Taiwan's first grand slam champion.